When it comes to horseshoes, one size definitely does not fit all. Just as you wear different shoes to go hiking or dancing, horses participating in different disciplines wear the shoes best suited for their needs. The primary purpose of most styles of horseshoes is protection, as working horses experience wear and tear on the hooves. Gone are the days when most blacksmiths forged shoes by hand. You might find some specialist farriers still hand-making shoes, but they're the exception. 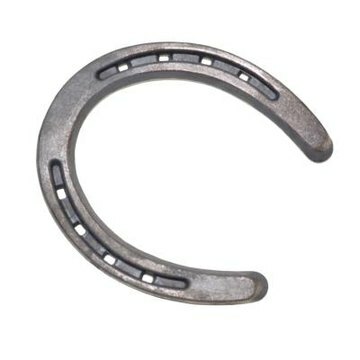 And not all modern horseshoes are made of steel, although it remains the most common material. You can find shoes made of aluminum, plastic and rubber. Not all shoes are nailed into the foot; some are glued on. The type of shoe best suited for your horse depends on the condition of his foot, the ground surface he generally works on and the amount of work he does. Standard "keg," or factory-made, shoes are available in various sizes and widths. These are either flat bar, concave or fullered bar shoes, used on the average horse doing moderate work. Fullering refers to the groove inside the shoe, which is where the farrier puts the nails. While concave shoes are fullered, they're made with a sloping internal edge. Draft breeds might sport the plain but long-wearing flat bar. What the horse does in a particular discipline often dictates the type of shoe used. Racing plates are designed, as the name implies, for racehorses and those in race training. These lightweight shoes are made of aluminum. If you play polo, your horse might wear shoes designed to keep her from cutting her opposite leg when making quick turns at speed. Reining horses might wear sliders, wider than a standard shoe to aid in the slides necessary in the sport. Horses such as Tennessee Walkers and American Saddlebreds are shown in shoe types particular to their breeds. If your horse suffers from specific hoof problems, your farrier might put on shoes with a therapeutic or corrective purpose. Horses with laminitis might benefit from a heart-bar shoe, which has no opening like the traditional shoe but is circular. It covers the frog, giving that area support. The egg-shaped egg bar shoe is often used for horses with navicular syndrome, a disorder of the navicular bone within the hoof. If your horse experiences issues with his gaits, such as forging, shoes with rolled toes can change the way the hoof lands. Forging occurs when the horse's back foot clips the front foot when moving. Work with your farrier and veterinarian to find the best shoeing solution for your horse.